Chiefs offensive coordinator Eric Bieniemy declined an opportunity to interview with the Cardinals, according to Ian Rapoport of NFL.com (on Twitter). He’s set to interview with the Jets and Buccaneers on Wednesday, the Dolphins on Thursday, and the Bengals on Friday, so he has a full plate as he also gets set for the Chiefs’ Divisional Round game on Jan. 12. 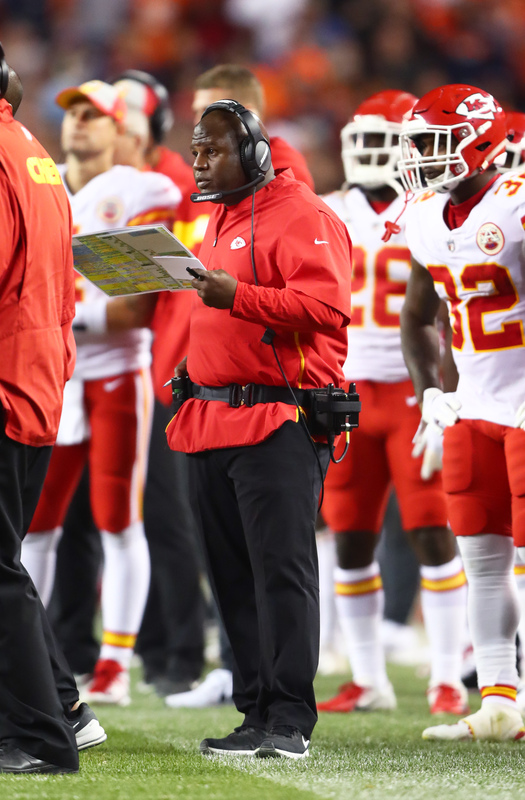 Bieniemy has been a popular candidate early in this cycle and it seems awful likely that he’ll land a job behind the strength of the Chiefs’ offense and Andy Reid‘s strong recommendation. In 2017, the Chiefs ranked fifth in total offense under Matt Nagy’s command. Bieniemy had big shoes to fill as he took over for him but Patrick Mahomes & Co. exceeded all expectations. The Chiefs finished first in total offense in 2018 by averaging an eye-popping 425.6 yards per game. Bieniemy, who enjoyed a nine-year playing career before entering the coaching ranks, has been with Kansas City since 2013. Prior to that, the 45-year-old served as the offensive coordinator at Colorado, so he has call-playing experience despite the fact that Reid is hands-on with his team. He may not want to go out west. He’s in high demand so he’ll get to coach wherever he wants. He probably didn’t want to go to a team that fired the coach after one season. He knows that he doesn’t want to coach the Cardinals, for whatever reason, and doesn’t want to waste his or the Cardinals’ time. There’s nothing wrong with declining an interview if you don’t think the fit is there. Especially if it’s only for the Cardinals to “check” a box. With the resume he has and the interest he’s gained, I think he is more than just a Rooney Rule box checker. Heard same thing about Goff before McVay took over. Rosen has all the tools but the talent is limited there. I disagree. While not top of the league, many QB’s would love to throw to David Johnson, Larry Fitzgerald, JJ Nelson, and Gresham. RR is outdated, reverse-discrimation PC BS. Maybe you two are racists. Biemeny is one of the hottest coaching candidates out there. He’s going to get probably multiple offers, given the success rate of The offense this season, his experience as a coach and player, and the success of Reid coaches. Never decline interview’s? So interview for a job you don’t want, get the job, and then turn it down like you buddy in New England. Yeah, that really looks professional. Well, you can do all those things and still look professional. The problem is, McDaniels actually accepted the job and then backed out. I’m sure there are often coaches that get multiple offers and they simply accept the one they want. Teams just don’t announce when they make an initial offer that is refused. He has 4 interviews in one week plus whatever responsibilities he has with the Chiefs. Probably simply a time consideration thing and only accepting interviews with situations he feels best about. I’d have to agree with you. Seems like a great fit. Say no to McCarthy. Please. Bieniemy has been becoming more talked about as a head coach every year for the past few years. A whole lot of NFL people apparently think very highly of him, and I’ll be curious to see if he lands a job and how he does there. So wouldn’t be offensive coordinator for the Kansas City Chiefs be a better job than the head coach of the Cardinals?